The Independent Coal & Coke Company Remains before they were torn down. 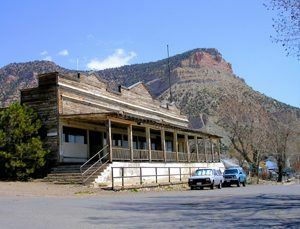 Though Kenilworth, Utah is not quite a ghost town, still sporting a population of about 180 people, as well as a post office, it isn’t what it once was during its coal mining hey days. Like most other Carbon County towns, Kenilworth got its start when coal was discovered in the area in 1904. 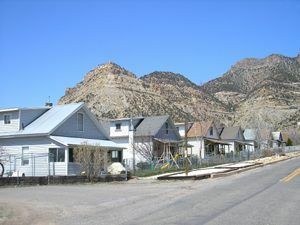 In the spring of that year, a Spring Glen, Utah resident named Heber J. Stowell was searching for stray horses in the mountains to the northeast of his home when he spied large outcroppings of coal. He soon showed some samples to his friend, Wade H. Lawley of Price, and the two men began prospecting. After discovering three workable coal beds, the pair began mining operations just northeast of present-day Kenilworth. However, the access was difficult, so the operations were moved farther up the mountain. The pair soon gained the interest of two investors — James Wade of Price, and Fred Sweet of Salt Lake City. Stowell built a wagon road to the workings and hauled water from the Price River. Eventually, a steep tram was built to the entrance of the mine. By February, 1906 there were 16 men working in the mine, which was known as the Wade-Lawley prospect. Before long, there were others starting operations in the vicinity. Stowell and Lawley called their organization the Western Coal and Coke Company. In late December, 1906, the Independent Coal & Coke Company, a Wyoming corporation bought the Aberdeen mine formerly worked by Wade and Lawley. It was reported that 40 men were employed by this new company. The following month, grading began for the building of railroad tracks which would connect the Kenilworth mines with the Rio Grande Westwern Railroad at Spring Glen. On August 10, 1907 the Independent Coal & Coke shipped its first coal, over its new railroad using a leased Rio Grande Western locomotive. In the meantime, the Independent Coal & Coke Company had secured 160 acres and began to lay out a townsite in 1908. It was named Kenilworth, from the supposed similarity of the three peaks surrounding the coal camp with the famous 12th Century castle in Kenilworth, Warwickshire, England. By March, 1908 the Kenilworth Mine was producing about 300 tons per day. Six months later, in September, the mine was shipping 600 tons per day and could not keep up with the demand. In October, 1908, the company gained a contract to supply naval ships with coal and 30 additional men were hired. Boarding houses soon replaced tents, several cottages were built, and the town gained a coffeehouse and a Boy Scout Hall, which also was used for dances and as a saloon. School was first held in a small house, be fore a formal building was erected across the street. Students attended this school up to the eighth grade, then were bussed to Spring Glen and Price to finish junior and senior high school. By 1910, the town’s population had reached about 500 people, and boasted a post office, restaurant, hotel, store, and a school. Coal production for the company grew steadily from its opening in 1907 to 1912, at which time production had increased to some 411,661 tons per year (or about 1,372 tons per day for a standard 300 day year). Beginning in 1912, the company began to operate its own generators, replacing the former steam power it had generated from burning coal. The following year, Kenilworth produced a record 2,339 tons of coal on one day in March, 1913. Afterwards, production fluctuated over the next four years. Record production took place again on December 31, 1917 when 2,831 tons came out of the combined Kenilworth and Aberdeen openings. By 1917, the Kenilworth mine was connected with the Utah Power and Light system. Two years later, the operation was unionized. By the early 1930s, the mine was still flourishing and the town sported a new hospital, tennis courts, and more new homes. During the years of World War II, the mine company prospered, producing more than a million tons of coal annually. Unfortunately, before the war ended, the mine and the community would suffer great loss when coal dust ignited an explosion in the mine on March 14, 1945. The explosion immediately took the lives of three miners and nine more were injured. Of these, three of the men died within a week, and another a few weeks later. The dust blast was apparently set off when a direct current power line broke and the arc from the break ignited the dust. In 1947, Kenilworth reached its peak population of 1,050. But, it wouldn’t last. In the 1950’s, coal production slumped. The Independent Coal and Coke bought out the Utah Fuel Company holdings and merged the Kenilworth and Castle Gate No. 2 mines into a single entity in 1961. On March 8, 1968 Independent Coal & Coke Company corporation was dissolved. The surface workings and tipple at Kenilworth were gradually dismantled. 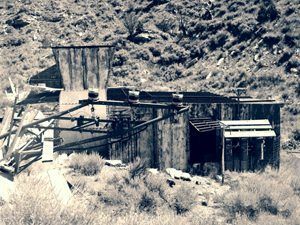 By 1983, the old mining operation site was selected as a reclamation site, which called for the demolition of all remaining facilities and the return of the mining site to its undeveloped condition. The work was completed by late 1984. By 1990, the town’s population had dropped to 350. Today, the small residential community of some 180 people boasts a spectacular view looking out over the valleys and mountains to the west. Kenilworth lies along State Route 157 north of the city of Price, and 4.7 miles east of Helper, Utah.